JEDDAH — Seven men were lashed at a public square in Jeddah on Friday after a criminal court convicted them of assaulting a traffic officer on duty and a security guard who came to his aid at Al-Hamra Corniche in southwest Jeddah about a year and a half ago. The court sentenced the men — a young Saudi aged 18 years, a Nigerian, two Yemenis and three undocumented Chadian residents — to 1,500 lashes each and a total of 80 years in prison. The lashes were to be given in several installments with a gap of a week between each. The first portion of the lashing sentence was carried out on Friday at the same location where the attack took place. The leader of the gang was also sentenced to 18 years in prison while two gang members received 16 years in prison each. The fourth was sentenced to 15 years in prison and the other three to five years each. The incident in question took place in March 2017. 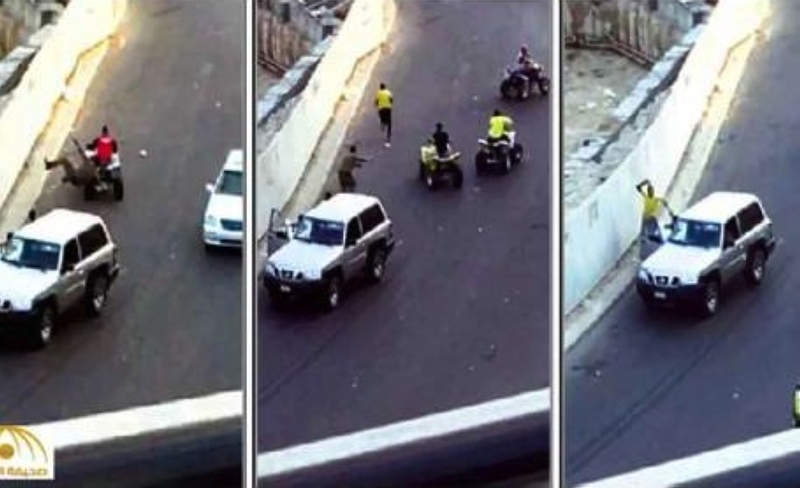 According to Jeddah governorate officials, the gang of young men, all riding four-wheel all-terrain vehicles, attacked the patrol policeman after he prevented them from entering a recreation area on the Corniche. The men were subsequently arrested and put on trial. A video that went viral on social media showed the men running over the officer. The video clip was recorded by an eyewitness from an apartment overlooking the scene. It showed how one biker ran into the policeman who fell on the ground, but got up just on time to avoid a second attack. The drivers kept moving menacingly in a gang style near the police vehicle. The assault shocked the nation and prompted calls for severely punishing the culprits. The video footage also showed the biker beating the security guard seated on the passenger side of the patrol vehicle. The police officer got out of the vehicle and chased the assailant, but could not catch him. As he returned to the police vehicle, the bikers tried to run him over. The officer was injured in the attack and treated at a local hospital, while the security guard was unharmed despite the beating. After the incident, police cordoned off all roads in the area and arrested three men, including the young Saudi and two undocumented Chadians. Police later arrested four other men who were seen in the video and identified by those arrested earlier.